Tag: Zuni Bear Fetish Lg. 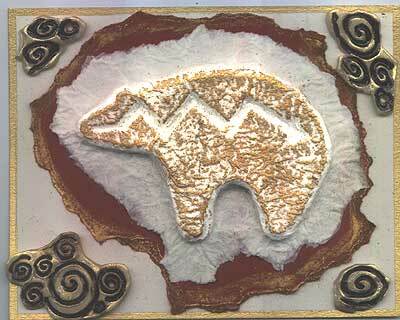 “Zuni Bear Fetish, Lg.” and “Sunburst, Lg.” are embossed in silver on rust confetti card stock. “Sunburst, Sm.” is embossed in silver on a formica tag. 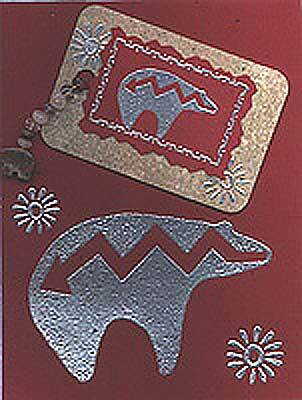 “Zuni Bear Fetish, Sm.” and “Southwest Frame, Med.” are embossed in silver on a rust confetti card stock rectangle trimmed with deckle scissors. This rectangle is layered on the formica tag. Glass beads are attached to the card stock at the hole in the formica tag. The last bead is a cut and polished rock bear. Card by Margaret Wiggin. Tags: beads, Decorative Scissors, Embossed, Frame - Southwest Med., Margaret Wiggin, Sunburst Lg., Zuni Bear Fetish Lg., Zuni Bear Fetish Sm. “Sunburst, Sm.”, “Return Symbol, Sm.”, and “Return Symbol, Lg.” are stamped in black on tan parchment card stock. 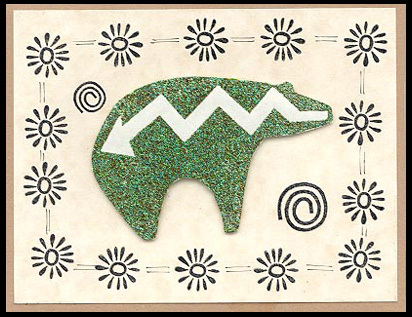 “Zuni Bear Fetish, Lg.” is embossed in verdigris, cut out and mounted on the parchment card stock. Lines are drawn between the border images. The parchment card stock was layered on light brown card stock. Card by Margaret Wiggin. 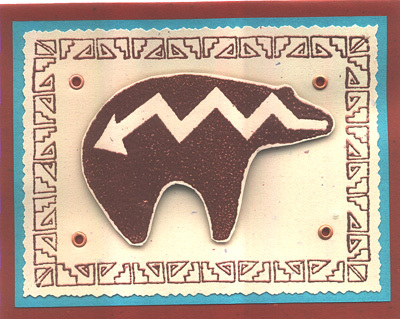 Tags: bear, Embossed, Margaret Wiggin, Return Symbol Lg., Return Symbol Sm., Sunburst Sm., Zuni, Zuni Bear Fetish Lg.